It’s not a secret that I love trains, a good deal of my per-computing childhood was spent reading train books, visiting the Silverstream Railway in Wellington (I think I was the youngest member at the time) and when I was younger Dad would sometimes take me out on Wellington’s suburban trains for daytrips. The fact that Wellington’s rolling stock was (and in many cases, still is) positively ancient made it fantastic for a young train fan, since all the locomotives made such great noises, screeching and rattling around the place. 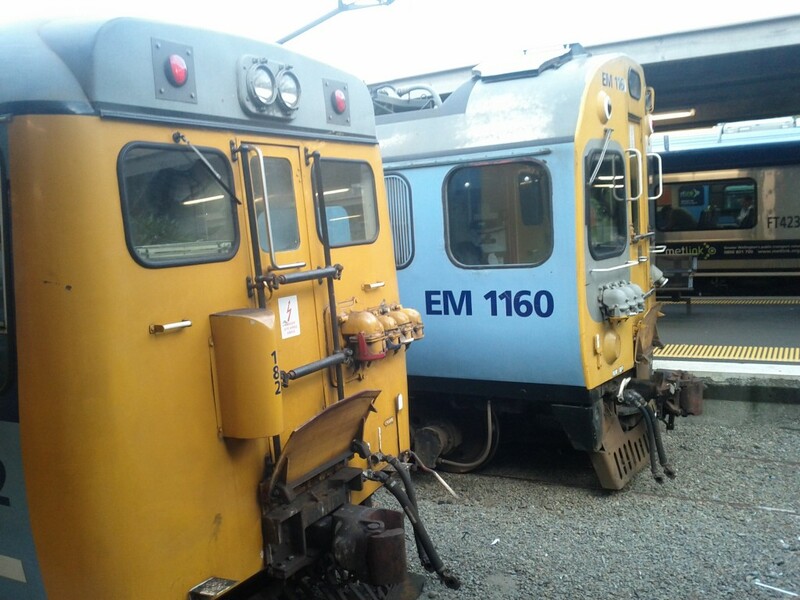 Until recently with the 2011 introduction of the Matangi FP Class trains, most of the Wellington region passenger trains were the NZ EM/ET class dating back to 1982 or even worse, the NZ DM/D class trains which date all the back to 1938. DM/D train running the Johnsonville Line in the foreground. An EM/ET class in the background. The current Johnsonville Line was laid and the current Johnsonville station opened in 1938, which replaced the original rail line dating back to 1885. If you’ve caught a train on it recently, you might be forgiven for thinking that nothing has changed since. This entry was posted in Uncategorized and tagged awesome, geek, johnsonville, matangi, silverstream, trains, travel, wellington. Bookmark the permalink.